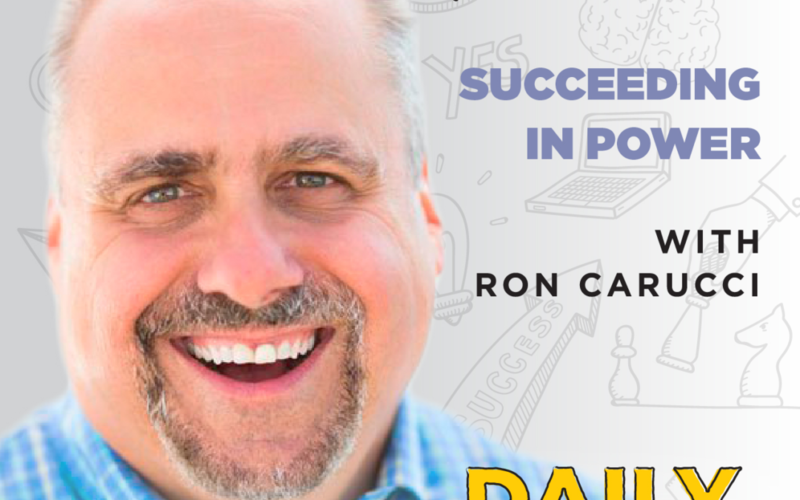 Today’s guest, Ron Carucci, is a two-time TedX speaker, the bestselling author of eight books, and a popular contributor at Harvard Business Review and Forbes. Ron led a ten year longitudinal study on executive transition to find out why more than fifty percent of leaders fail within their first eighteen months of appointment. During this study, Ron uncovered four differentiating capabilities that set leaders apart, and these findings are highlighted in his groundbreaking, Amazon #1 bestselling book, Rising to Power, co authored with Eric Hansen. Ron Carucci is also the cofounder and managing partner at Navalent, working with CEOs and executives pursuing transformational change for their organizations, leaders, and industries. He has a thirty year track record helping some of the world’s most influential executives tackle challenges of strategy, organization, and leadership. In addition to his regular contributions at Harvard Business Review and Forbes, Ron has also been featured in Fortune, CEO Magazine, Business Insider, MSNBC, Business Week, Smart Business, and Thought Leaders. We feel incredibly lucky to have him here with us today, teaching us unbelievably valuable and inspiring ways to succeed in leadership. 1: Context – look around you and be aware of what’s actually happening. Be curious. Understand that your environment has as much to change in you as you have to change in it. When you enter the story, the story has a history before you; study it. Be curious. Adapt accordingly. 2: Breadth – As organizations and communities get bigger, people pull apart further into their own camps. In order to have any kind of lasting impact, you have to create cohesion, you have to stitch the seams that naturally appear between people. 3: Connection – Prioritize your network, not based on who you can get something from, but who you can help succeed. Our greatest connections happen when people believe that we have their back. 4: Choice – So often in life, we’re so interested in pleasing people and making sure that other people like us, that we dole out way too many “yes”es. Entrepreneurs especially know how hard it is to say “no.” But too many yeses means that you’ve diluted the focus of a community, you’ve diluted resources, you’ve confused people, you’ve created competing priorities. Don’t be afraid to narrow the focus. My mentor said to me many, many years ago as I began my career: “nothing in life is irrevocable except death.” At a time in our careers and in our lives where we spend too much time wondering, second-guessing fear and failure, worrying about skinning our knees, apprehensive and second-guessing our own ambitions and desires … I wish I had not done that. I wish I had been more courageous and less anxious about trying things. She always says to her students, “your career is not about a linear path. Your career is not some predictable upward climb on a ladder. Your career is about going through open doors when they’re open. And if you never go through the open door, you’ll never know. And if you go through the open door and it winds up being not what you thought, find another open door. But you’ve got to stay open to the world around you, and try, and not worry so much about skinning your knees.